I learned a new word early in my college career. Prereq. It is short for, "prerequisite," a required prior condition. Algebra is a prerequisite course for Algebra II. Algebra II is a prereq for calculus. You must crawl before you walk. First do this, then do that. So with each new adventure I have encountered over the last year, I have known that it would be important to listen first and learn the most. I needed to watch those around me and ask questions. Lots of questions. Folks who know me will tell you that asking questions is definitely not a problem for me! Approaching each new adventure with an open mind is a prereq for success. I am passionate about excellent education for kids and I want to be successful, so I head into each day with an open mind so that I may be able to learn from those around me and benefit from their expertise. 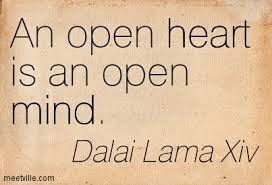 But their is a prereq to an open mind. First, I must be open-hearted.